Everything has been a blur the last couple of months - Big!Project underway, Moving the Whole House, as well as preparing for GenCon 2015! Let me tell you, it's been a lot more hectic than I had planned, and so many hiccups/changes/etc happened along the way. I'm going to go ahead and blame that GenCon was early this year. 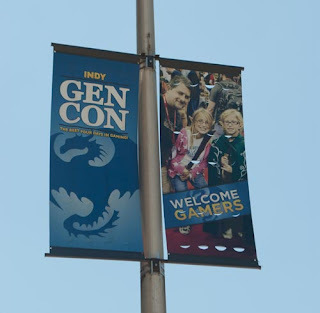 :P For those uninitiated, GenCon tends to fall mid to late August, and this year it was the freakin' LAST WEEKEND IN JULY. Seriously people, let's not do this again, pleeeeeeease? I've never seen a city so happy for a convention. We ended up getting in late, and checking in (even the hotels were decked out all nerdly), then of course heading to Will Call. Many people will probably as "But why do will call pick up when they can just MAIL you the badge?" 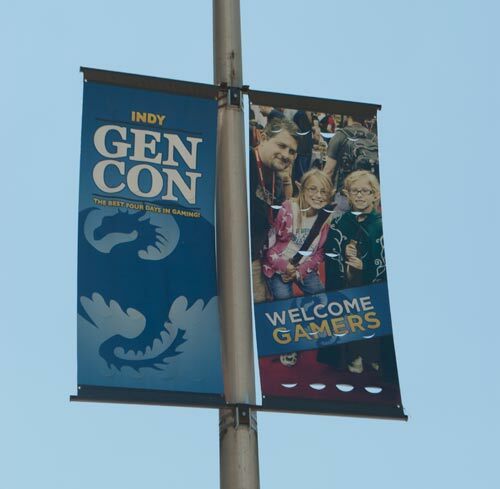 - and I'll have you know that when GenCon finds a problem, they FIX IT ASAP. Three (?) years ago, the will call line was terrible. People got cut off end of night, had to wait in an abysmally long line. So what did they do when we complained? THEY MADE IT 24 HOURS ALL WEEKEND. And that's why we go at 11 pm to get tickets. :) The wait's only about 30 minutes, and that was us being all the way down the side hall. After the first half the wait, we got to the queue line. Finished up the last of the costuming sewing bits, and went to bed. We needed to get up early, as we had opening of the doors, seminars and of course costumes! It was very windy when we had our photoshoot. Thankfully the costume was pretty light, and easy to move around in (and comfy shoes for once) so I spent most of Thursday traversing the halls. Got ambushed by a Fox News interviewer guy who tried to cause controversial trouble with his questions, but I think I managed to be elegant enough to talk around them. Proceeded to freak out the rest of the day about that. 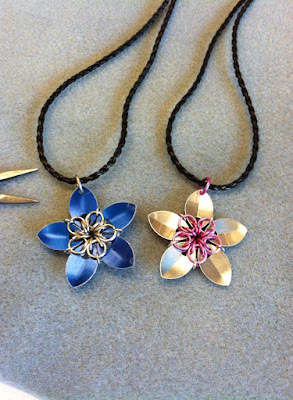 I got to do a panel about making chainmaille flowers, which was fun! It was supposed to be two hours, buuuuuuut they had really good directions, and I make crafts/cosplay/artwork and it only took me half the time. They turned out pretty, and I'd love to make more in the future! (it was kind of relaxing to be honest). I'd love to put them on ribbons n stuff. So before I get into my grander adventures, I wanna say one of the things I always look forward to is the food area at GenCon. You might think "oh it's just a food court" but really, it's a huge mall-like open air market for Food Trucks. 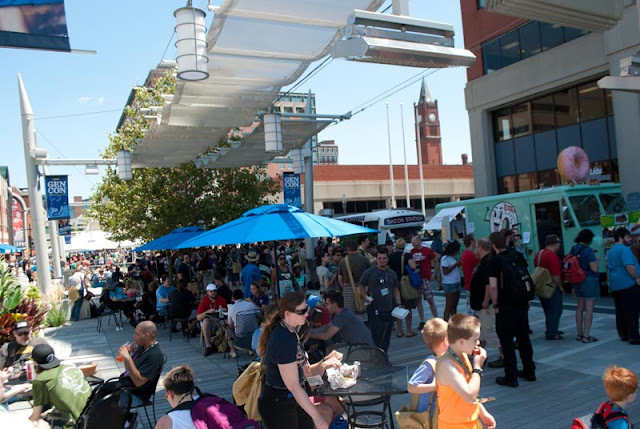 Food trucks are basically little restaurants on wheels, and they have the BEST. FOOD. EVER. Over the weekend I have gourmet pierogies, giant donuts, 3-cheese grilled cheese sandwiches (smoked gouda, anyone? ), mac and cheese on a baked potato as well as some of the best vanilla cupcakes I've ever had. So worth it. So tasty. If you ever end up going to GenCon do yourself a favor, and put aside a bit of cash to partake of these awesome delicacies. Dishes range from around $8 to $13+ depending on the truck, and they're BIG. But so very very worth it. Also, if you are planning on eating, change up your internal clock so you can eat at "off" times - aka, go after the rush. DO NOT eat around Noon, or 6pm. Other times are fine, and you might only have a 30 minute wait in line + cooking time. ANYWAY, back to the show - because GenCon isn't JUST food trucks! 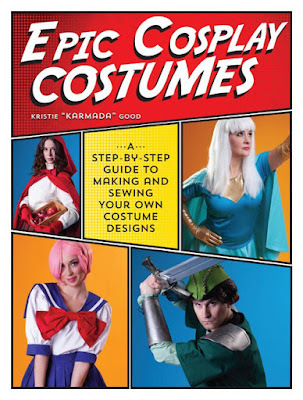 Let's talk cosplay for a moment. 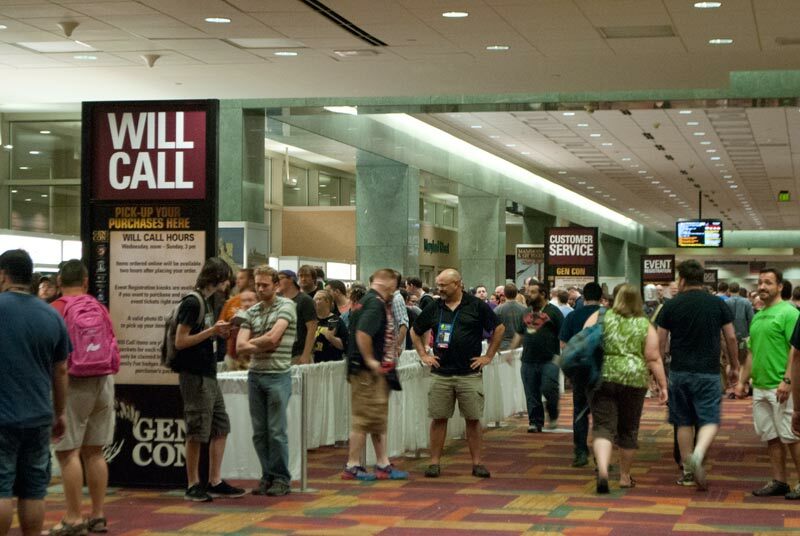 GenCon is a HUGE convention - they get a LOT of people into the event. This year, it peaked just a little bit above 61,000 people. That's right. Sixty-one thousand. People. Now a decent chunk of us are cosplayers. We like to come in costume, and people like to take pictures. WELP. Last year this caused the main hall to be the worst area of traffic I'd ever seen. You couldn't get ANYWHERE. 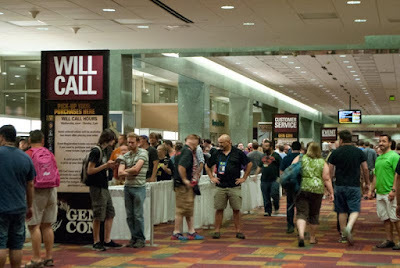 But remember what I said about GenCon? They see a problem: They fix it. And this year was no different. 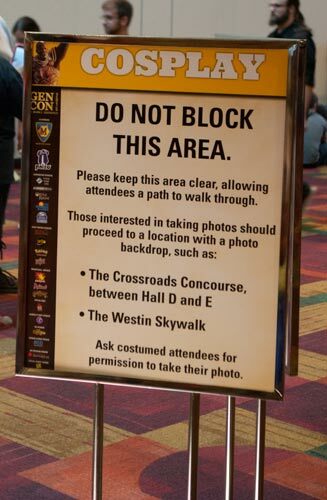 They actually created designated "Cosplay Zones", where cosplayers could go stand if people wanted to take their picture. The area was pretty big, and it kept traffic flowing behind. 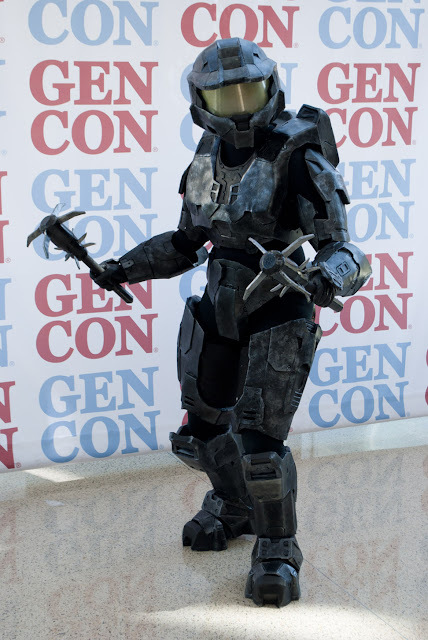 It also was a great way to see the cosplay without hunting people down a hallway in a crowd! The other fabulous thing is they were very clear on costume rules, as well as really emphasizing to the attendees to ASK permission first. It was very sweet of them to actually worry about us, and make sure we were taken care of (there was a whole page on it in the guide! ), and I deeply appreciated it. I hope they keep the backdrops and cosplay zones next year, because man, it made life so easy. I've been kind of on the silent downlow with hubby this past 2 months for a couple of reasons. Now, the first being I'm working on Big!Project (which I'll have some good things finished up on that this week YAY! ), the second being we decided to undertake a task of monumental proportions. Making armor. Remember when I was talking about foam armor all the time ago? Well, I stopped posting because it was getting close and dicey and frankly we didn't have the time to hardly take in process shots (don't worry, next suit will have ALL THE PICTURES). Spike Grenades: Sticky AND Explodey! A few months ago, while traversing through Netflix, I came across a series called Red vs Blue. I had remembered watching it in College, but had lost track of it. It's basically a web series using the Halo game sprites to be silly/tell stories. Comedy ensues. WELP apparently they made like 12 seasons (we're on the 13th now), and I had no idea. I had been feeling really really down, so hubby and I sat down and watched through ALL of them, and as they say... the rest is history. I fell completely in love with it (darn thing made me cry with all the feels), and we came to the agreement we needed to actually MAKE some armor. 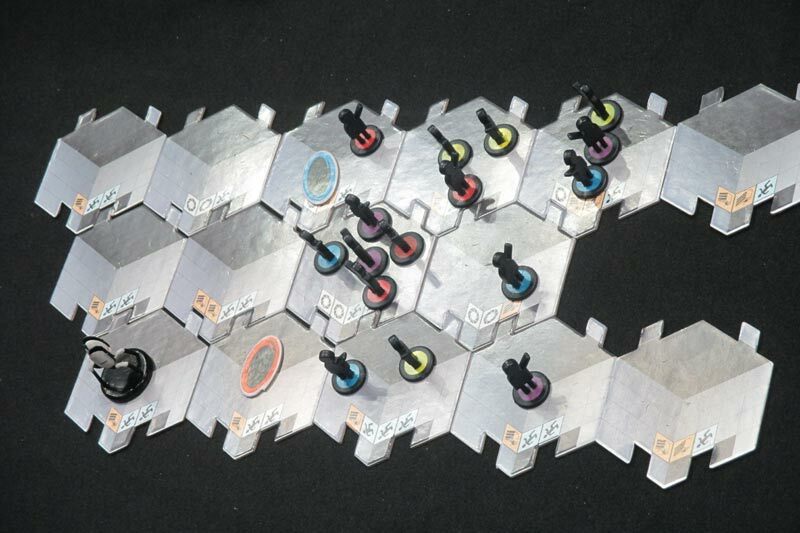 ...then we decided we wanted it for GenCon. Two months away. We wanted two suits, but parts of it gave us hassle, so only one got done (the torso fit me better the first time around). Once we move, we'll start up finishing the parts of armor suit 2 - Church. BUT I DIGRESS AGAIN. I'll talk more about this in depth later when I actually go through all my photos. We planned on having the suit on Friday and Saturday, and BOY was I nervous. But the crowd really seemed to like it, I had a lot of fun walking around like a badass space marine, and learning to navigate in Hobo!Visor (we're working on an actual see-through one. We ran out of time). I'm a bit sore, and have a few calluses, but I had a hoot. I can't wait for hubby to join me as Church next year and we can go and be all dorky together! Also, shout out to the attendees who could figure out who I was! Made my weekend, you guys. Last but not least, after a long arduous weekend, Sunday came, and it was time to wind down and head out. I dressed as Casual!FemShep on Sunday, because WHY NOT. 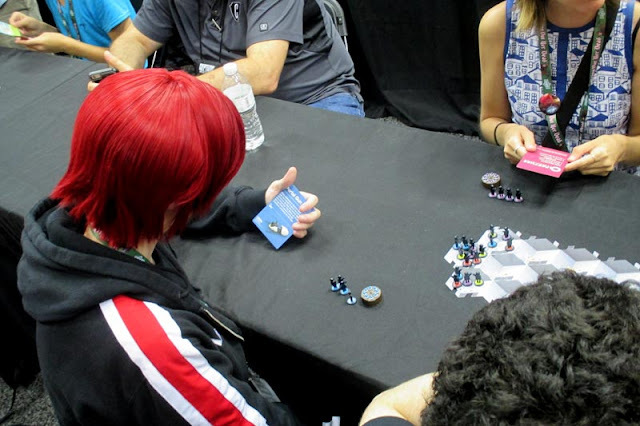 We went around and demoed some easy card games (hubby kept winning accidentally. OR SO HE SAYS), and as we were milling about, we ended up coming across the annual Destroying of the Balloon Creature. You see, every year, they build this huge balloon monstrosity, then get donations for the chance to WRECK it at the end of the weekend. 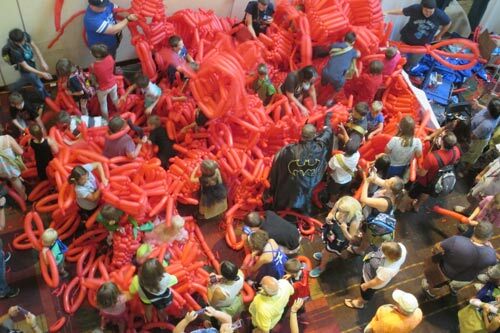 This year, they made a huge octopus (I hear they were going for a world record? ), and at the end, unleashed the children to destroy it, and it was quite possibly one of the most entertaining things I've watched in a long time (we saw it from above). That octopus didn't stand a chance. I've got a video, but I'm trying to figure out how to get it up here at this time. So have a picture instead! GladOS is ready for testing. Portal: The Uncooperative Cake Acquisition Game. 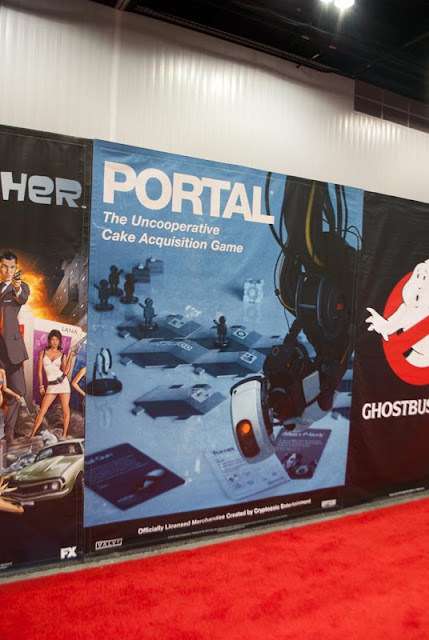 It's a board game based on the Portal games, where you goal is get the most amount of cake and/or destroy the other test subjects! Gameplay was simple, and I can see if you've got a group of people who know all the rules, playing can be a fun, chaotic mess. My little people were blue. BLUE TEAM 4 LYFE. It's kind of like playing on a big moving conveyor belt of "rooms" where you can earn cake, find turrets, place portals, and all the like. Cards are used to give you special actions and new global rules, all the while you attempt to sabotage your other test subjects so you get the most cake. I may have placed a portal on a turret and a portal on a room of test subjects. WHAT COULD POSSIBLY GO WRONG. Ended up driving home late, got in during some storms, and surprisingly enough I'm still mobile today. That's how you're getting this write up so early. :) I also needed to get it out of the way before I forgot all my details! Mental health panel was great, will go next year. Got to see a writing panel where it turned into a discussion prompting how many times the other artists could get Terry Brooks to make a Grumpy Face. Good times were had. 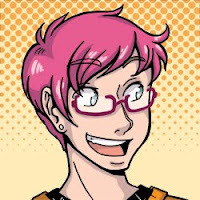 Found Questionable Content artist! Bought all his books n stuff (again! he had new things!). Got to meet Wayne Renolds (main artist for Pathfinder). Tried not to fangirl too hard on him. Got to meet Wes Schneider from Pathfinder. Tried not to fangirl too hard on him either. Did get to finally tell him how awesome Carrion Crown is. Found a new card game: Room Party. Laughed so hard when playing it with pals, I went and bought the first expansion. Will be buying the Anime expansion for next year. Accidentally found the front of the costume parade - couldn't see well, went the wrong direction at the end fork and had to walk around the entire building to get back to hubby. Whoops. Got some dice, OF COURSE. 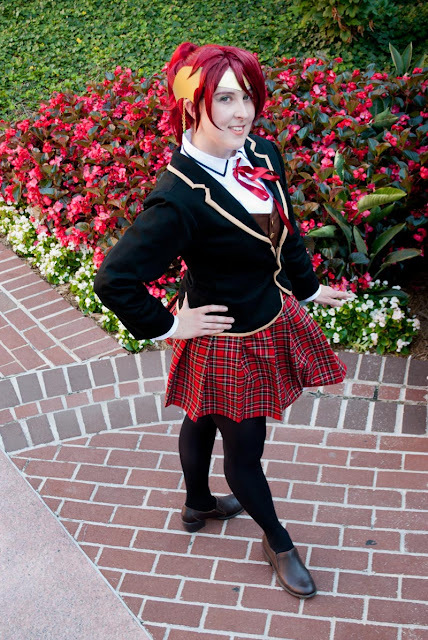 And for now, I am going to go rest, and if I'm lucky, actually go through all my photoshoot photos this week!